Hannah graduated from the University of Lincoln with a first class BSc (Hons) degree in Herbal Medicine. She is a registered Member of the National Institute of Medical Herbalists (founded in 1864, the oldest professional organisation in the U.K. representing medical herbalists). Hannah lectures on the Clinical Diagnostic Skills module for the BSc Herbal Medicine degree course at Lincoln and is also a NIMH New Members’ Scheme Mentor. 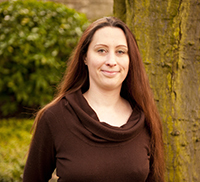 She is also a fully qualified first aider, workshop leader and regularly features on local radio and in the press.